The omega-3 fatty acids found in fish oil are known as “good fats.” They are vital for human health and well-being, but the body can’t make them. You have to get them through diet or supplementation. New studies are being published almost every day as scientists and doctors learn more and more about how and why omega-3 fish oil is so vital for good health. 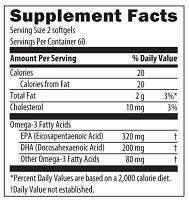 Here are some important reasons that a good quality fish oil supplement is important in your daily diet. Omega-3s have shown to have powerful anti-inflammatory effects that reduce joint pain and morning stiffness caused by common joint conditions. According to the American Heart Association, fish oil is effective in promoting heart health and helps to reduce risk factors. Clinical studies of heart attack survivors have found that daily omega-3 supplementation dramatically increases cardiovascular health. Omega-3s were also found to inhibit the development of factors that compromise arterial health. also shown that taking a fish oil supplement improved the effects of exercise on burning body fat. Volunteers who were given fish oil showed greater weight loss as compared to those who did not consume fish oil. Exercise combined with fish oil had a positive effect on the body shape and body composition of the patients. ITG Omegas are essential to take while you are on the 3 Step program. If you have any medical issues about taking omegas please consult your physician.